For the first time since Feb. 21, 2010, the Miami women’s basketball team left the BankUnited Center with a loss. The No. 23 Hurricanes fell 79-67 to the No. 20 Tennessee Lady Volunteers on Sunday, as a furious second-half rally came up short. The loss ended a 41-game home winning streak, tied for the second longest in the nation. That halftime deficit for Miami (2-1) was 25 points, as Tennessee (3-1) led 46-21 at the break. The Canes entered intermission shooting 20 percent from the field, with the starting five just 2-of-26. Tennessee scored first in the second half and the 27-point margin was the largest of the day for the Lady Vols, who are in their first season under coach Holly Warlick. It was a 25-point game with 12:28 to play, and that was when Miami started its comeback. A 3-pointer by freshman Caprice Dennis with 8:26 to go capped a 14-2 run for the Canes that cut the lead to 13. Tennessee worked it back up to 18 with 6:34 left, but Miami countered yet again. Senior Morgan Stroman and freshman Keoyna Hayes led a 16-4 run over the next four-plus minutes. Senior Stefanie Yderstrom hit four free throws in a matter of 34 seconds at the end of the run and Miami had the deficit down to six – 71-65 – with 2:30 to play. Miami had a chance to make it a one-possession game when Yderstrom took an inbounds pass and hoisted an open triple from the left corner, but it bounced off the rim and Tennessee scored at the other end. The Canes got the deficit back down to six with 1:18 left, but could get no closer. Tennessee scored the game’s final six points, all on free throws by sophomore Ariel Massengale, putting a dagger in the Canes’ winning streak at the BUC. 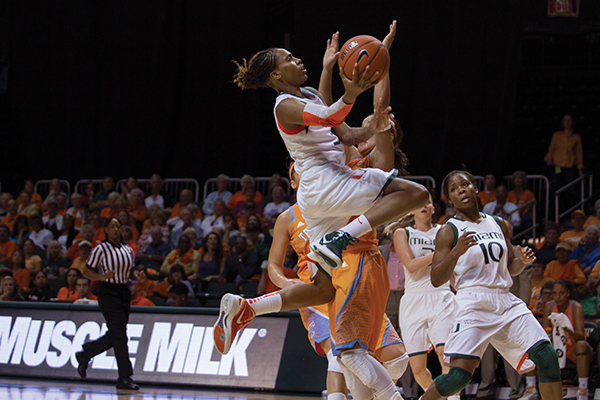 Michelle Woods led UM in scoring, which she has now done in all three contests this season. The sophomore guard had 17 points on 6-for-13 shooting. Morgan Stroman was the only other Hurricane in double figures, finishing with 13 points and eight rebounds. Miami returns to the court at 5 p.m. Friday, as the team hosts Florida Atlantic in the first round of the UM Thanksgiving Tournament.